It’s very easy to join in, just choose any day during the school year when the children bring their teddy bear, or a favourite soft toy, along with them for the day. Each child brings in a £2 donation with their bear to support vital research to help sick babies and children. 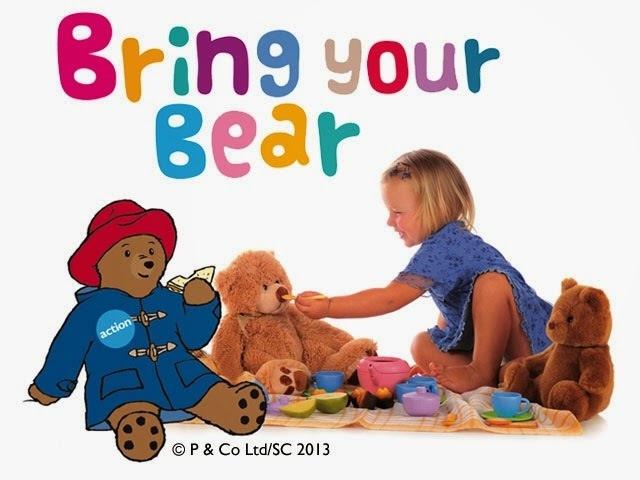 Many Bring your Bear participants organise a whole day of fun activities, such as reading Paddington stories or holding a teddy bears’ picnic. Children can also take part in a drawing competition with a chance to win a visit from Paddington himself, as Action Medical Research is his favourite UK charity. Every nursery and school that registers will receive a free fundraising pack, including a poster and Paddington stickers, and access to an online toolkit full of useful materials. These include tips on linking the event to the Early Years curriculum and activity sheets to download. Money raised will help fund medical research into conditions affecting babies and children. Medical research can save and change children’s lives. Yet surprisingly, medical research into conditions that devastate children’s lives is poorly funded. Action Medical Research is currently supporting work around stillbirth, epilepsy, meningitis, cerebral palsy and brain cancer, as well as some rare and distressing conditions that severely affect children.